We’ll be including CrossFit Striking sessions on the schedule in the near future! We’re awaiting the delivery of some equipment. In order to participate you need MMA gloves (mixed martial arts) for hand protection. As you can see from the photo the gloves have an open palm and the fingers are exposed. These features are necessary for our purposes because we will be mixing the striking of boxing and mma with crossfit type workouts that include body weight exercises, exercises using the pull-up bar or rings as well as dumbbell and kettlebell exercises. The below MMA gloves are from Combat Sports and can usually be purchased for about $25.00. 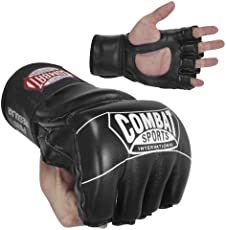 You don’t have to purchase from this company, but the MMA-style gloves you purchase should be open palm and open fingers. We have a few sets of brand-new gloves like the ones shown below that are for sale.